Your ranch or farm means a lot to you, and a fence will help to protect your property for years to come. Whether you need a fence to keep animals safely inside or to keep unwanted guests outside, Rustic Fence has exactly what you need! 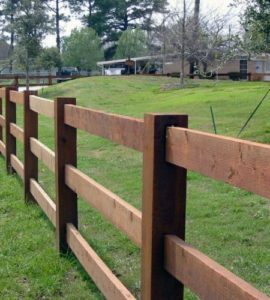 With over 50 years of experience, we guarantee that our fence will perfectly protect your ranch or farm while also enhancing the beauty of the area! Every ranch and farm has its own unique layout, and we have a number of fences that work for each unique area. Plus, if you desire a custom built fence tailored to your ranch or farm, we are more than happy to bring it to life! We want your farm or ranch to be completely and beautifully protected, and with over 50 years of experience, we are sure that we have what it takes to get the job done! For privacy, security and beauty, a properly constructed stockade fence substantiate property value with privacy. The dimensions available in this side-by-side fence are 1 x 4 in spruce and 1 x 4 or 1 x 6 in cedar. Options include dog-eared, pointed, and flat top fences with cap/trim. fix or as a way to contain horses during a show, a smooth wire fence is an affordable yet highly effective alternative to more permanent fencing. 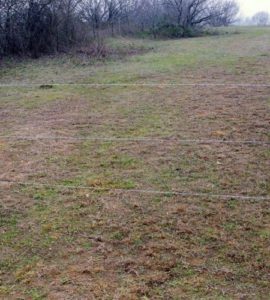 While it may seem simple to install on your own, your smooth wire fence should be crafted and installed by experts so that it remains taught, is spaced correctly, and to minimize the risk of breakage. At Rustic Fence, we have over 50 years of experience crafting and installing smooth wire fences so that your farm can be effectively contained. We want you to feel confident in your new fence, and that is why we will work with you during every step of the process. We also provide a warranty on all products so that you can rest assured about the quality. Wooden ranch rails were the industry standard before PVC ranch rails even existed. Traditionally, wooden ranch rails were used by early settlers to contain their livestock while also setting property lines. Today, these fences are still used for the same purposes while also providing a beautiful aesthetic touch to your property. Every property and lot is different, and we will work with you to develop the perfect customize wooden ranch rail. This means choosing the perfect length, width, height, and color or design for your property. We want you to be satisfied with your new fence, and that is why we also provide long-lasting warranties with all of our products. While wooden ranch rails may seem simple, they can easily fall apart if the materials are not of the highest quality and if they are not expertly installed. At Rustic Fence, we have over 50 years of experience producing these fine rails so that you never have to worry about them again. 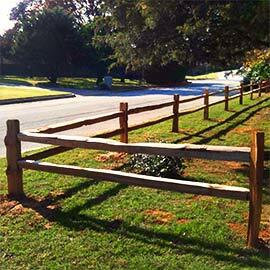 Once installed, your landscape and security will instantly benefit from our wooden ranch rails! Since 1964, we have been providing Arlington, TX and beyond with the highest quality fences imaginable. Contact us today for a free estimate and to see how we can help you. With a smooth wire fence from Rustic Fence, your animals will be safely contained at all times! (817) 275-2151 or (972) 725-7984. Since each of our most popular fences works for different purposes and works best in different areas, we are happy to work with you to find out which fence is perfect for your property. When it comes to choosing a fence for your ranch or farm, you want the best available to ensure a lifetime of satisfaction. With Rustic Fence, you are guaranteed that satisfaction!